MONTRÉAL, January 30th 2019—Genetec Inc. (“Genetec”), a leading technology provider of unified security, public safety, operations, and business intelligence solutions today announced that the South Grand Community Improvement District (CID) in St. Louis, Missouri is using the Genetec Stratocast™ cloud-based video monitoring system to deter license plate theft in its parking lot and provide video access to the local police department to help reinforce security. One of the services offered by the South Grand CID is free parking. At any time of the day, drivers can park in a central parking lot to visit businesses or residents. While this lot has always been convenient and safe, license plate theft was troubling nearby areas. To deter license plate theft in their own community, the South Grand CID board decided to add video surveillance to the lot. Currently, three cameras monitor the entire 90-space parking lot. Video recordings are sent over a wireless network which connects to the South Grand CID main office, just a few blocks away from the lot. With this cloud-based video monitoring system, Rachel Witt, Executive Director at South Grand CID, can quickly and easily view video from anywhere, at any time. “Using the cloud video system, I am able to find and view the video in seconds. I can narrow down my search based on dates and time and watch the event unfold with all camera feeds up on the monitor. It’s really that simple,” commented Witt. 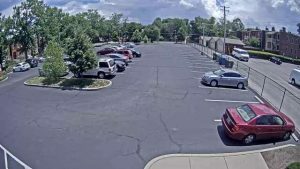 Only two weeks after installing the Stratocast video monitoring system, a visitor reported that their license plates had been stolen. “The visitor provided a description of the car, and a timeframe in which the incident likely happened. Using the Stratocast system, I was able to find and view the video in seconds. I could clearly see the suspect enter the lot, remove the plates and leave in his own car. Since the police are very busy here, I was able to bookmark the video recording and then notify them that the video was ready,” said Witt. Stratocast has made it easy for the South Grand CID to give video access to local police so that when a crime is reported in the district, officers can immediately begin to conduct investigations without leaving their desks. While the South Grand CID manages and owns the Stratocast solution, officers can log into the system and view video recordings when required. This is enabled by the Genetec Federation™ feature, which gives an organization access to manage multiple independent Genetec systems as one. A memorandum of understanding was signed so each parties’ responsibilities are clear. “Instead of driving over and picking up a DVD, officers can directly access video from our cameras to see what happened. Not only does it help speed up investigations, it saves officers’ valuable time,” continued Witt.